awesome love it. A great treat. Love to sip and watch the sun go down. Great Gift Strong sipper comes in a great package a fine gift for a good friend. tiki tiki love it as a floater in tiki drinks. A must have in the cabinet. well rounded i like this as both a mixer and a sipper. Versatility makes it a must stock for me. Ibis Fine fine sipper. Really well done. I like it a lot. Sipping time An awesome sipping rum and fairly priced. Worth finding and spending an evening with. Like it Priced right. Great bottle. Fine sipping rum. You will be back. Solid Really like a staple of my bar. My go to sipper at the end of a workday. 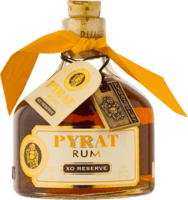 Pyrat Like it. Drinking the last bottle slow as no longer made. Nice Good sipper. Nothing really stands out but a good rum to have on the shelf. my daily my daily drink. Also good to find in the dives I hang out in. good sipper a decent sipper. A cheaper alternative to some of the pricier darks. American Solid maple rum. Made in America. Support local distillers! Good Solid not as fine as its older siblings but still a good buy. Spiced A better spiced rum. Ok for mixing. Fine for clubbing. light find it ok for mixing. Will do in a pinch but why a premium for it at the bar? Spiced An easy mixer. Ok for that. Not a sipping drink for me though. In a pinch Fine pre mixed drinker for a beach run. Not for serious drinking. Bacardi for mixing only. Will do in a pinch. Not something I look for when i order. Ugh Good for your bug out bag could use for starting fires etc.